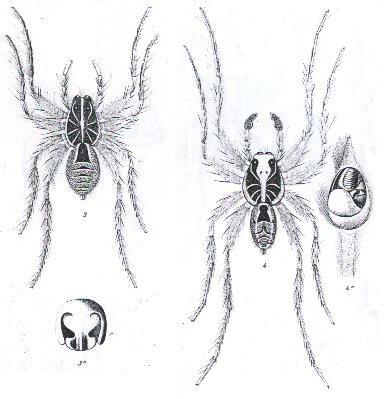 Female and male of Lycsoa godeffroyi [as illustrated in Koch, 1877a]. Cephalothorax length female 10.5 mm, male 10 mm. N.B. Koch (1877a) himself synonymised Lycosa godeffroyi with Hogna bellatrix, which was not accepted by C. F. Roewer (in Platnick, 2001). Lycosa godeffroyi L. Koch, 1865: 867. Lycosa godeffroyi L. Koch.- L. Koch, 1877a: 957-959, plate 83, Figs 3, 3a, 4, 4a. Lycosa bellatrix L. Koch, 1865: 866 (synonymised in L. Koch, 1877a: 957). Lycosa godeffroyi L. Koch.- Hogg, 1900: 77. Tarentula godeffroyi L. Koch.- Strand, 1907i: 216. Lycosa godeffroyi L. Koch.- Rainbow, 1911: 268. Lycosa godeffroyi L. Koch.- Rainbow, 1917a: 488. Geolycosa godeffroyi L. Koch.- Roewer, 1955c: 243. Geolycosa godeffroyi L. Koch.- Rack, 1961: 38. Geolycosa godeffroyi (L. Koch).- McKay, 1973: 380. 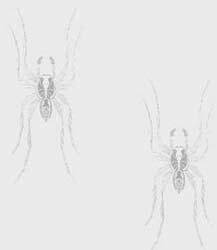 Lycosa godeffroyi L. Koch.- McKay, 1985b: 77-78. Lycosa godeffroyi L. Koch.- Moritz, 1992: 314. Lycosa godeffroyi L. Koch.- Platnick, 1993: 487. Koch (1877a) lists material from Sydney [33°53’S, 151°13’E, New South Wales], Peak Downs [34°55'S, 138°36'E, Queensland] and Wollongong [34°25’S, 150°53’E, New South Wales] (Museum Godeffroy), from Sydney (Bradleys Collection) and from 'New Holland' ('Kgl. Naturalien Kabinett zu Stuttgart, Musum Stuttgart). 3 females (British Museum of Natural History London: 1890.7.1.2371, 1919.9.18.396-7) (McKay, 1985b). 1 female, Peak Downs [34°55'S, 138°36'E, Queensland] Museum Godeffroy Nr. 300 (Zoologisches Institut und Zoologisches Museum, Universität Hamburg Rack (1961)-catalogue 458). 1 female, 1 juvenile, Queensland [no exactl location] Museum Godeffroy (Museum für Naturkunde, Zentralinstitut der Humboldt Universität, Berlin: ZMB 3468) (Moritz, 1992). Holotype of L. bellatrix L. Koch, 1865: female, Sydney [33°53’S, 151°13’E, New South Wales] (British Museum of Natural History, London: 1919.9.18.1187; labelled Tarentula necatrix, could possibly be bellatrix) (McKay, 1985b). Common (Australia wide), e.g. the most common species in the collection of the Museum Victoria. Chapter VI in McKeown (1963) provides a very intimate and personal account of L. godeffroyi from the perspective of a non-scientist.